No matter the end goal, the first thing any business must accomplish is to engage with clientele. Connecting with customers should be the primary purpose for any business. While it does matter what the other business goals are, engagement is the most important goal. Without engagement, customers are sure to come and go rather than stick around. With positive interaction, customers stay put, if not for life, for a very long time. Recently studies have shown that wearing name badges make customers more comfortable while doing business with you. 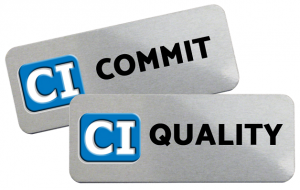 Wearing a name badge will remove the barrier that instinctively lies between you and your customers. Name tags always make you more approachable. While there are several different types of environments where name tags are helpful, the following settings have found that personal identification is an absolute must. We’ve all seen it, the customer who walks into a store and doesn’t get the attention they think they need, so they leave. They were looking for a service or product that store offers but didn’t feel that the business met their needs. While it may seem like a small thing, a simple way to avoid your customers feeling this way is to provide name tags for your employees. These tags immediately remove all barriers and allow customers to ask questions and express their concerns to those who care. They establish trust and keep people coming back to your store. Uniforms and stethoscopes aid in helping to identify workers from patients and visitors when you’re in a hospital. However, name tags ease the pain of remembering your nurse’s name or actual position. The healthcare business knows that personal identification is a must when dealing with patients. They need to establish trust and wearing any identifier helps with this. Photo ID Badges are perfect for these positions. They not only present a name but also help put a real face to that name and thereby create a comfortable and healing atmosphere. Hospitality covers a large area of businesses. 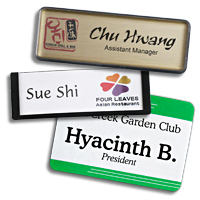 From restaurants to travel agencies, this business type is acutely aware of the necessity of name badges. Taking care of your customer is priority one in this business! And to help establish your brand as well as your approachability, name tags should be worn at all times. Again, it’s all about making customers feel at ease. They are, after all, trying to relax! Another great use for a Photo ID Badge is a reporter. No one likes a busybody! So, identify your journalists quickly and give them a sense of security with a name tag. This identification presents them in a way that people can trust. And it gives them the credibility they need to get the whole scoop on the story they are covering. Typically referred to as a “press pass,” these photo ID badges can get them into places where an unidentified person can’t get. Whether your business is to sell something to the public or to get the scoop on the latest new story, establishing a trust is the key to helping your clientele stay with your company. Approachability and comfort are important goals for all businesses. Get your name tags today to help you keep your customers happy. Here are a few quick and easy ways to help you improve your business with ONE tool! Being able to recognize someone instantly is a huge benefit to a business these days. It will also contribute to improving your business contacts and employee relationships. 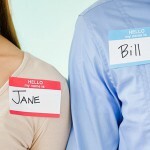 Following is a quick list of four ways to improve your overall business by introducing name tags into your daily life. First, it gives your employee a name! Sometimes you might run into an old friend or acquaintance while you are out shopping or at a business function. But, most of the time, you won’t know too many people. All companies can benefit from their employees using name tags. 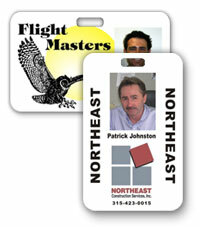 Provide employees, volunteers or event-goers with a name tag or name badge for easy identification. With each person displaying their name on a name tag, customers and attendees will quickly identify the people they need to ask for help. And when that happens, the employee’s confidence and comfort level increases. All in all, wearing a name tag encourages people to be more mindful of their surroundings. By giving employees name tags, you are providing security for your office or store. And, who doesn’t want a secure business? With a simple branding logo, employees are easily identified by customers and other employees. No one will ever have to guess at who their coworkers are again. Another great tool for security is our photo ID badges. By adding a picture, a name and a logo, the wearer is sure to get noticed; and for all the right reasons! Third, name badges help to hold employees accountable. This simple tool, similar to a uniform, is the perfect way to remind an employee of where they are. It gives them a sense of direction and purpose. And, it makes it easy for you to follow or spot them in a crowd of customers or event attendees. It is another way to ensure your employees are representing you and your business in the exact way you need to be represented. Fourth, help yourself in rewarding/disciplining your employees. When issues arise at your office, store or restaurant and you find a customer needs to speak with management, it becomes easier to identify the employee that needs to be pulled aside. Whether that is for a job well done or a little bit of coaching, a name tag helps the customer know who to report if or when it becomes necessary. Names are what it’s all about these days in business. Do your customers know your’s and your employee’s names? Help them out with a name tag today at www.nametag.com!